Austin graduated from Pleasant Hill High School in 2014. While in high school Austin excelled in football, basketball and track which earned him a scholarship at Central Christian College of Kansas. He was extremely gifted with an ability to pick up difficult tasks quickly. Austin worked as an electrician, lifeguard and construction worker, among other jobs. He loved studying Greek and Roman history and had a desire to travel and see the world. In his free time loved playing Xbox, especially Fornite and Rome Total War. Austin was gifted in working with dogs and spent many hours training his own faithful companion, Shadow. He had a zest for life and was always up for an adventure with friends. He enjoyed spending time outdoors and discovering the beauty of Colorado. He was creative in nature and as a young boy would make his way into the woods behind his home where he would emerge with items he found. Austin enjoyed spending time with his family, especially teasing his siblings. He particularly loved beating his family in games of Hearts and Scrabble, which he did often. Visitation will be held 6:00 to 8:00 p.m. Friday, March 29, 2019, at the Stanley-Dickey Funeral Home in Pleasant Hill, Missouri. Funeral services will be held 10:00 AM Saturday, March 30, 2019, at the Grace Family Fellowship Church, 125 N. Armstrong St. Pleasant Hill, Missouri 64080. Reverend Wyatt Shanks will officiate. Interment will be in the IOOF Cemetery, in Craig Missouri. Pallbearers are John Brookshire, Christopher Camp, Sutton Crabtree, David Lyday, Josh Hastings, and Chase Dyer. Memorial contributions are suggested to Teen Challenge of the Hawaiian Islands and may be sent in care of the funeral home. 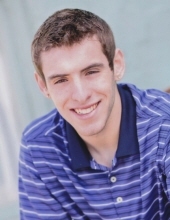 To plant a tree in memory of Austin David Yount, please visit our Tribute Store. "Email Address" would like to share the life celebration of Austin David Yount. Click on the "link" to go to share a favorite memory or leave a condolence message for the family.